Kilimanjaro Safaris is an excellent narrated ride in Africa and one of the best attractions at Disney's Animal Kingdom. Think “Jungle Cruise” on land, with fewer corny jokes... and actual live animals. 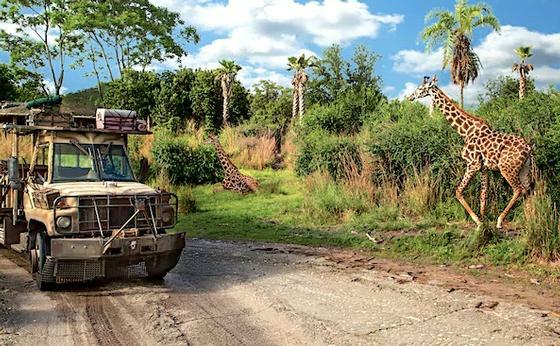 You’ll ride in bus-like, open-air, all-terrain vehicles through part of the park’s 110-acre Harambe Wildlife Reserve, where you might see up to 34 species of African animals, including rhinos, lions, giraffes, and hippos. Disney has cleverly hidden the barriers that separate most species, allowing your tour to drive through what looks like open African wilderness. Visit early in the morning to see the most action — many of the animals are napping by mid-day. Great ride which focuses on the animals! Always a fun adventure. It is especially good at night time when the park is open late. One of the best detailed rides. There are moments, amongst the Savannah with the animals strolling by your vehicle, where you feel like you are in Africa. Over the years they have toned down the "elephant poaching" plot, and it makes for a better experience. A must ride at animal kingdom.